love so much this look so fresh and chic! I love this neutral beige white outfit, looks amazing on you. Really chic. Love the outfit! Those heels are gorgeous! I love your heels, they're just perfect!! love the nudes..very chic look! Is that you, because you look gorgeous. Love the look and yes, I am so ready for Spring! this is so gorgeous delicate and classy I love the look!! Bravo! Great colors nice touch! Love this look!! effortless chic! such a pretty look! 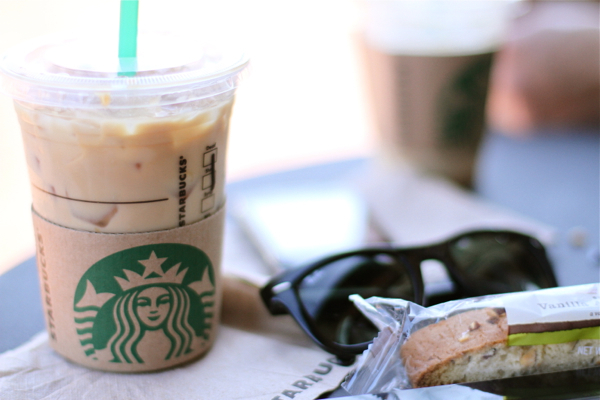 as usual:) That starbucks drink looks so good! What's the name? very classy look with amazing heels! I own the same heels, adore how you styled it with the refreshingly chic trousers! Stunning shirt, El! I love neutrals. Adore the colour of your shirt El! Have a fabulous weekend. I know I am going to keep my balcony open all weekend long! Lola, my chihuahua will love it. Looks like a beautiful day and your outfit is perfect for it! I truly love how cropped pants look with high heels, you look lovely!! You really have style, I love it! you're so awesome elena- Starbuck's should pay you for how much you use their products in your blog. xoxoxo miss you! I love this simple & chic look. Perfect color palette, and those shoes are killer. Love it, you look so elegant!!!!!!!! Me encanta,pienso que lo voy a copiar enterito!!!!!!!! Perfectly styled! Love the shirt! Nica and simple outfit. You look so fresh! I really love your light neutrals, so ready for spring! Such a casual, chic outfit - love your handbag! Your photos are absolutely gorgeous. Thanks for following me. Following back. You look fantastic,i love this kind of outfits!